Prison dress fluctuates historically and from country to country; from regimented "uniform" to the wearing of everyday clothes; and from work wear to nongendered jumpsuits as categorization of "criminality." Its implementation, design, and production varies according to current penal thinking, the degree of surveillance required by political regimes, types of crime committed, and according to the criminal institution- from young offenders' to women's prisons; from "top security" to local prisons or from federal to state penitentiaries. In eighteenth-century America, Britain and Europe, regimes of "malign neglect" were prevalent, resulting in a disorder characterized by both men and women in rags, almost naked and the majority chained. Since crime was, and still is, for the most part, committed by the poor, privileges have been known to be exercised by inmates to procure their own clothing. Voltaire, arrested in France in 1727, demanded to wear his own clothes. In Ireland, in 1887, Home Rule dissenters were permitted to supplement prison issue coarse woolen (frieze) garments with overcoats. Prison reforms in America and Europe in the early nineteenth century, influenced by the Enlightenment and early "normalization" penal theories, saw prison dress as integral to the philosophy of discipline, as a tool in the "curing" of deviant behavior. 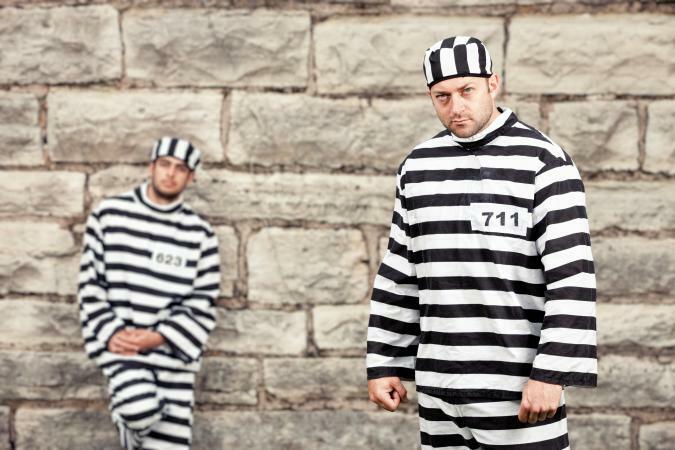 In America between 1820 and 1930, quasi-military regimes of "silence" and solitary confinement saw the introduction of black-and-white striped all-in-one prison uniforms in order to demean and identify prisoners, and to increase the likelihood of recapture should they escape. In Europe and specifically France, in the 1830s, the wearing of striped pants and blue linen overalls augmented surveillance of prisoners in chain gangs. In Australia, convict work gangs wore arrowed uniforms, while in Britain broad-arrowed, all-in-one prison uniforms were introduced in the 1870s Prison Act, as both a shaming and branding device. The arrows were not abolished until the 1920s in conjunction with post-World War I penal reforms. In addition to uniforms, prisoners wore hoods when moving from "useful" work to cells or when exercising, reinforcing nineteenth-century debates focusing on the convicted criminals reflecting on their criminal activities in isolation and silence. Continuing into the twenty-first century, it is evident globally that there is often a direct correlation between the degree of social control of prison regimes and the disregard for prisoners' human rights in the wearing of regulation clothing. "Every prisoner who is not allowed to wear his own clothing shall be provided with an outfit of clothing suitable for the climate and adequate to keep him in good health. Such clothing should in no way be degrading or humiliating (Orland, p. 169). " Since the 1950s, variations in prison clothing have only approximated to the UN declaration and '"normalization" debates that consider confinement, itself, to be punishment enough, while prison conditions should apply civilian standards in relation to food, clothing, and education facilities. In the United Kingdom, unconvicted prisoners are allowed to wear their personal clothes and each prison sets its own system of privileges, one of which may be the wearing of civilian clothes. However, women in Holloway prison, given the choice, tend to wear prison issue maroon or gray tracksuits, white T-shirts, and trainers, either to preserve their own clothes or to identify with their "total institution" selves as a survival mechanism. Convicted male prisoners are issued jeans, sweatshirts, blue-and-white-striped shirts, green work overalls and unbranded trainers. On arrival, they are often offered clothes rejected by other prisoners, which as a result are demeaning in their lack of fit. In the United States prison clothing is determined by type of institution and category of crime committed. 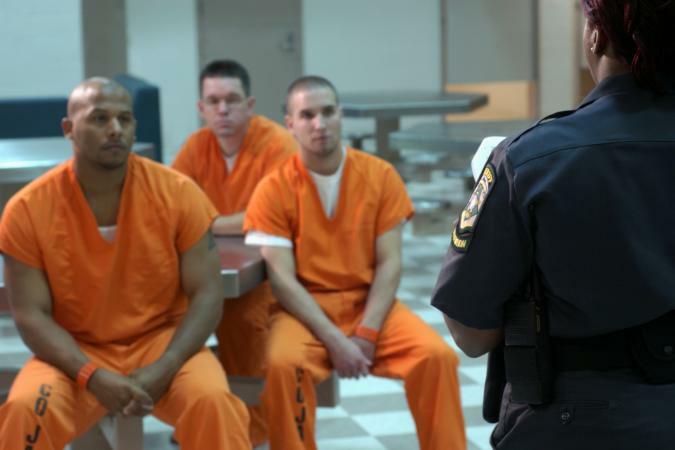 In federal prisons white jumpsuits are worn inside the prison, while orange outfits are worn in transit. Women prisoners are allowed to wear their own clothes after 5 P.M. In both state and federal prisons some categories of prisoners are able to wear their own clothes or prison-issue jeans, T-shirts, branded trainers and loose prison-issue overalls as work wear. In Immigration Detention orange loose-fitting jumpsuits are issued to both men and women, which some women find demeaning because it is against their cultural norms to wear pants. Both British and American prison dress is produced in prison workshops by inmates under strict controls as to design, regarding seam allowances, lack of pockets, sizing, fabric, and color. Internationally, prison dress varies in relation to a country's penal policies, wealth, or prisoner categorization system. The degree to which prisoners are allowed to wear their own clothes at times demarcates "normalization" as rehabilitation, foreseeing the return of the prisoner to "normal" life after release, as in Sweden and Holland's 1997-1998 "model" prison systems, Switzerland's "open prisons," and Lithuania's 1997 "own clothes" policy, which was hailed by penal reformers as a victory for prisoners' rights. The issue of not wearing prison dress has been central to protests by political prisoners campaigning for the right to separate political status from convicted criminals, as in Irish prisoners' "blanket protests," 1976-1982, and in Peru, 1985-1989. In other circumstances the wearing of civilian clothing reflects a return to regimes of "malign neglect," as in Haiti's unsegregated men, women, and juveniles' prison in Port-au-Prince in the late 1990s. Recent penal debates include the advantages and disadvantages of electronic tagging and, although not strictly a prison-dress issue, it raises concerns, as Foucault indicated, about the "recoding of existence" within prison walls, commensurate with social control or the rehabilitation of prisoners through the regulation of dress and identity. See also Dress Codes; Occupational Uniforms. Foucault, Michel. 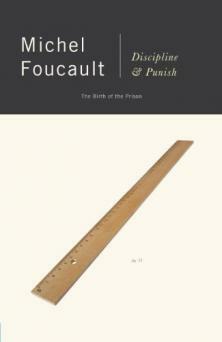 Discipline and Punish: The Birth of the Prison. London and New York: Penguin Books, 1991. Goffman, Erving. Asylums. London: Penguin Books, 1968. Mayhew, Henry, and John Binny. Criminal Prisons of London. London: Frank Cass and Company, Ltd., 1971. Morris, Norval, and David Rothman, eds. Oxford History of the Prison. Oxford and New York: Oxford University Press, 1995. Orland, Leonard. Prisons: Houses of Darkness. New York: Free Press; London: Macmillan, 1978.